The Philippines’ largest carrier Cebu Pacific says it is looking to work with local budget airline Tigerair Australia as it begins service to Sydney. 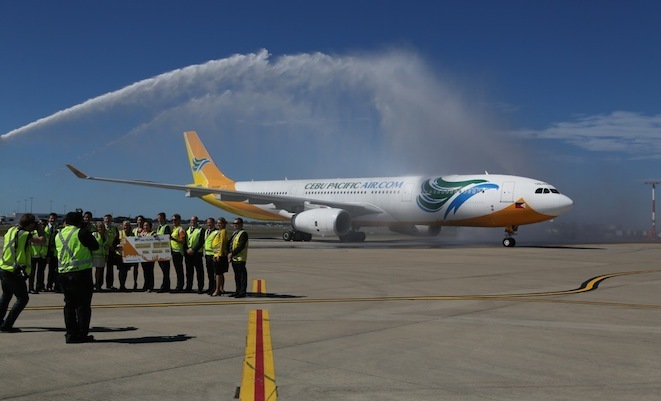 Cebu Pacific’s inaugural flight to Sydney 5J 7295 touched down Kingsford-Smith at 1056 local time on Tuesday and was greeted with a water cannon salute. 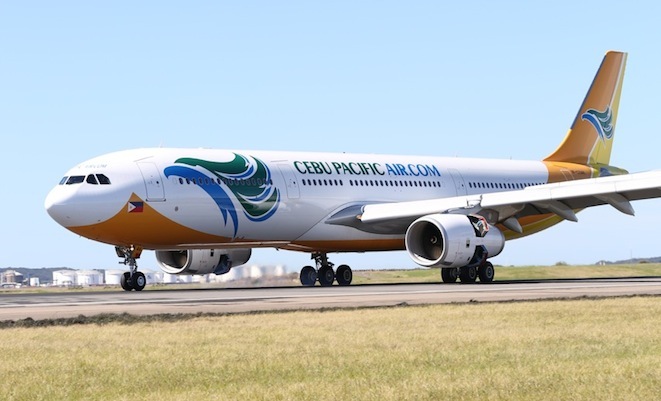 The 436-seat single-class Airbus A330-300 was on the ground for a little over 90 minutes before returning to Manila as 5J 7296, which departed at 1232. Cebu Pacific general manager for long-haul Alex Reyes, who was on the inaugural flight from Manila, says the airline is keen to cooperate with Tigerair Australia, having already forged links with Tigerair Singapore. “Tigerair Australia would of course be a natural partner,” Reyes said after stepping off the inaugural flight on Tuesday. Reyes said Tigerair Singapore’s destinations were now appearing on the Cebu Pacific website as part of an interline agreement. “They started selling us a couple of months ago and then just this month their flights are available on our website as well,” Reyes said. Moreover, Tigerair Philippines was a wholly-owned subsidiary of Cebu Pacific, having been acquired for $US14.5 in January 2014. While it has kept its current Tigerair livery, the airline was expected to be fully merged with Cebu Pacific over time. Cebu Pacific currently flew four times a week between Sydney and Manila, increasing to five times a week from December. Reyes said there were positive signs an expanded bilateral between Australia and the Philippines would enable the airline to operate a daily service some time next year. “Our understanding is that there has been an exchange of letters already from both sides,” Reyes said. Cebu Pacific offered the largest network in the Philippines with 34 domestic destinations in addition to 25 international points including Tokyo, Nagoya and Osaka in Japan. Reyes said most of the tickets sold on the Sydney route have originated in Australia, with many tourists keen to go explore the Philippines. “Forward bookings are looking good,” Reyes said.